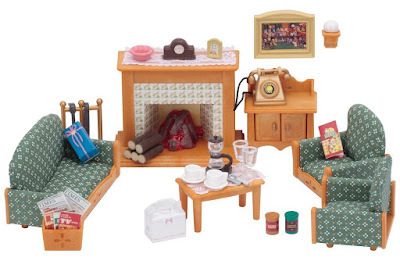 Head over to get this Calico Critters Deluxe Living Room Set for ONLY $10.77 (Retail $27.99)! The Deluxe Bathroom Set is an essential furniture set for any Calico Critters home. It includes more than 30 detailed accessories to create a complete bathroom. Also included is a bath tub, shower stand with removable shower head/sprayer, curtain rod, shower curtain, cabinet sink with mirror and double cabinet doors, toilet, hand sink with wall, floor tile section, storage cabinet with 2 doors, step stool, shower caddy, toilet roll holder, back brush, tub toys, towel, rug, toilet seat cover, toilet brush, 2 toothbrushes, 2 cups, soap bar and more!